Drain a node using OpsCenter Nodes administration. Clean up keyspaces and partition keys that no longer belong to a node. Use the Cleanup option in OpsCenter monitoring. Perform garbage collection (GC) using the Perform GC option in Nodes administration of OpsCenter monitoring. Run compaction on keyspaces and tables from node operations in OpsCenter. Flush the memtables to disk manually with the Flush option in OpsCenter Node Administration. Move a node using OpsCenter Node Administration. Enter a new token to assign to a node. This procedure is not applicable to virtual nodes. Run a manual repair operation on tables in a keyspace. Use the Repair option in the Node Administration area of OpsCenter Monitoring. Do not run a manual repair if the Repair Service or NodeSync Service is active. Drain a node using the Drain option in OpsCenter Nodes administration. Draining a node flushes all memtables from the node to SSTables on disk. Restarting DSE after draining a node is required for the node to start accepting writes again. Typically, a node is drained before upgrading to a new version of DSE. For information about manually draining a node, see the corresponding nodetool drain command. To simply flush memtables to disk, use the Flush option in OpsCenter or the corresponding nodetool flush command. If OpsCenter role-based security is enabled, be sure that the permission for the Drain option in Node Operations is enabled for the appropriate user roles. Click cluster name > Nodes. In the Ring or List view, select the node. The Node Details dialog appears. From the Actions menu, click Drain.. The Drain Node dialog prompts you to confirm the operation. When the drain operations completes, perform the operation that required draining the node, such as upgrading a node manually. Click Restart from the Node Actions menu. Note: The node cannot accept writes until DSE is restarted. 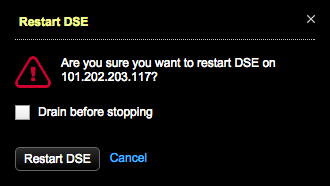 The Restart DSE dialog appears. Click Restart DSE. It is not necessary to select the Drain before stopping option again.